Sahaptin, or Ichishkíin Sínwit (literally, "(in) this language"), is a Plateau Penutian language spoken in south-central Washington and northern Oregon. 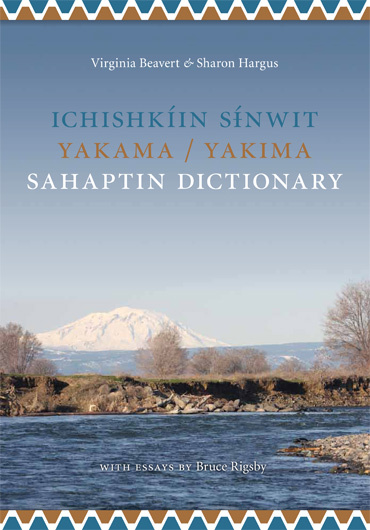 This dictionary documents the dialect of Sahaptin that is spoken by the Yakama people (ISO 639-3: yak). Bibliographic info: 576 pp., 100 illus., 70in color, CD, 7x10in. PLEASE NOTE: This page is very large. It may take a while to load. As per agreement between the authors and publishers, the dictionary web site contains only the Sahaptin-English portion of the dictionary and lacks the English translations of Sahaptin words and sentences. Heritage University students and enrolled members of the Yakama National can purchase the dictionary for 25% off list price, or $45, at the Heritage University book store.